Hi Guys, here is a pair of Back Load Horn (BLH) Enclosures that I got from a friend Keith who makes custom speaker cabinets. The above is a shot at Fred's place. 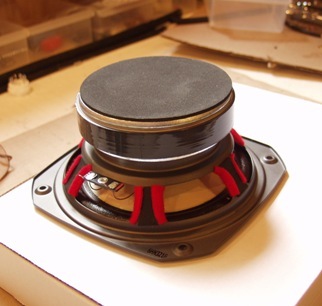 The drivers are Fostex FE206E fullrange speakers that were modified with a DIY phase plug. The photos below show the construction. Baltic Birch Plywood used throughout. The inside voids are sand filled. The brace is even contoured! It's going to be a while before I will be able to build like this! Mounting the drivers and adjusting damping in the compression chamber. Setup was NAD C521i into K-12M Tube Amplifier (tried a LM3886 chipamp too). 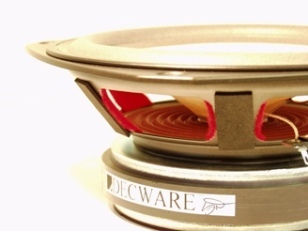 Drivers used for initial listening were well broken-in, whizzer treated with Dammar. Overall, very good! The speakers are very fast and that is an understatement. I estimate full bass to about 50-55Hz, F3 ~45-50Hz, F10 ~40-45Hz. The bass that is present is very full and not punchy like Fostex drivers can sound in a reflex box. Excellent midrange and the FE206E does not need a tweeter! Very very high efficiency! Dislike: midrange SHOUT. This will need to be addressed! I will start with the typical reversible driver tweaks, but from what I have heard so far, I think I will need to go to a phase plug. More to follow on the driver tweaks. Current status, applying (slow drying ) finish to cabinet. I got fresh pair of current production Fostex FE206E drivers. The box is stamped China and I am quite certain my older pair are from Taiwan, but I don't have the boxes and the are no identifying marks that I could find on either driver to indicate origin. The whizzer cone of the older drivers had been treated with dammar. 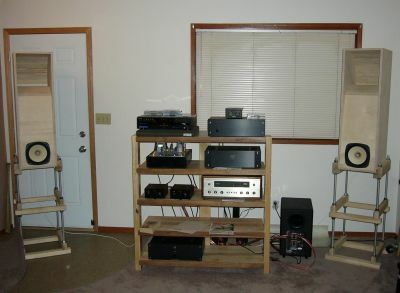 After a casual listening session, I thought the newer drivers were less shouty, but regardless they are too shouty in the midrange. This has me thinking that using dammar may have made them worse or it could just be the different production? The plan is to start with some reversible modifications. This is what I was thinking, but of course suggestions are always welcome. From the humblehomemadehifi site, connect the negative terminal to the speaker frame. I have read a handful of posts that say this actually works. Seems like a no brainer as it is no cost, quick and reversible. Common to both sites, is covering the large (reflective) surface of the magnet. It seems like wool felt is a common recommendation, but that would have cost me ~$40CDN (shipped, 2mm thick) so I opted to use locally available 50/50 cotton/acrylic felt (3mm thick) which cost $4CDN (on sale because it was a hideous color ). It looks like both sites glue the felt to the magnet and I figure I will try two layers (~6mm). I wonder what shape they cut to get a nice fit? This seems like a logical idea to cut down reflections off the back of the large magnet. Also common to both sites is the use of adhesive damping material on the spokes of the driver frame. I've done this in the past and it does cut back on ringing of the flimsy stamped frame. I've got some self adhesive air / vapor barrier that should work well. From the decware site, the use of felt lined spokes behind the cone also seems like a good idea to reduce reflection off the spokes back through the really thin paper cone. Also, I will fill the gap between the motor and the frame with duct seal / electrical putty. Any other reversible ideas out there? Man those are some beautifully build cabinets. I use rope caulk on the frame of my drivers and it does seem to help and removes easily. Keep us posted on your thoughts as you get them rolling Gio. Keith is an excellent woodworker. I just got the last coat on and will start on the drivers next. Hope to get them going in the next few days. Have you played around with the FE206E much? Since it is still winter and I would be finishing these indoors, I decided to go with 100% pure Tung Oil which is natural. I used 500mL on the boxes. The image below shows the finish which is not fully dry yet. The pure Tung oil is very slow to dry. Finishing wood is new to me, so comments and suggestions are welcome! Have you tried a BSC filter to cure the shout? I have found them to be very effective for taming a problem like you have described. I loaned a pair of my variable BSC filters to a local person who had build a design similar to your pictures and they definitely improved the performance of the speakers. Once he had found a setting he liked, he built a permanent pair of BSC filters. I have my doubts about the effectiveness of the other tweaks to completely resolve the problem. I should finish the mods this weekend and then I will re-evaluate. But from what I have heard thus far, I too am skeptical that these can make enough of an improvement to address the midrange shout. Regardless, they seem like logical tweaks and should be well worth the very little effort and cost associated with them. I have also read that others have used 1 to 4 ohms of series resistance and they have found that the additional resistance can help. This would be the next logical step. After that I would try a shelving filter, which I imagine it would be needed at a higher frequency than typical for a BSC. I should put together a variable BSC as it would be very handy, especially for something like this. I'll have to check the inductance on my variac, I may be able to use that as a variable inductor. Quick update - I got these going again. Did the mods that I had mentioned above and overall they do help. With the mods, I can live with the speakers now, but there is still some midrange shout that I would like to address. I get the feeling that phase plug may also help so I may try that down the road. I'll likely try some filters next. I'll get a page up with photos showing the mods soon. Thanks Gio. I'll probably go for the double ported boxes.